What type of favors do you need to create lavish & stylish thank you gifts? Printable party favors for baby shower gifts. 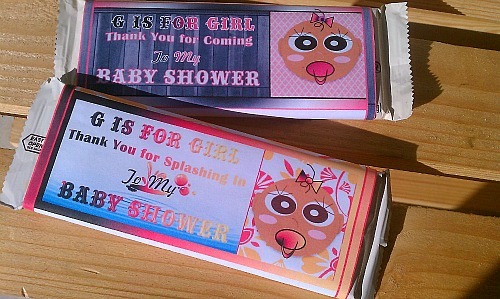 Create your own homemade baby shower party favors easily by using party printables. Made to print out on your home or office printer. Your local copy shop or photo lab will print PDF orders too. 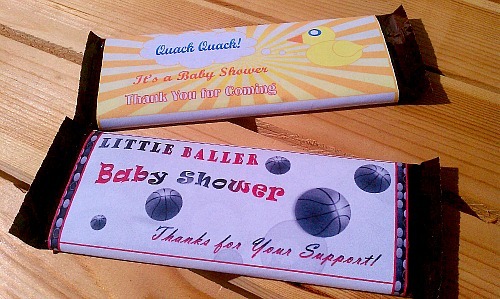 You can make baby shower candy favors, cookie favors, candle favors & more, easily yourself by using our candy bar wrappers, cookie sleeves, or our variety of printable shaped boxes etc. as you see fit. You may print all of the pages in your purchased printable files as many times as you'd like & need year after year. As long as you download & keep the files safe on your computer or digital storage device. All of our printables are sized to print out clear on standard 8.5x11 inch paper. 110 lb card stock paper looks great when creating boxes. Matte photo paper & flyer paper look well when printing candy bar wrappers. To view, print or personalize printable orders after they are emailed to you, open the file in the newest version of Free Adobe PDF Reader. To learn more about how our printable items work, how to add digital text to printables, or if you have any questions, View Our FAQ List or Simply Contact Us.